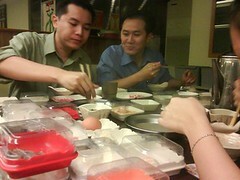 I had a nice farewell dinner with my colleague a few weeks ago at a steamboat restaurant in Puchong. 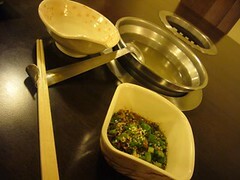 My stomach was an inch wider when i went out of Mizi Shabu Shabu restaurant. 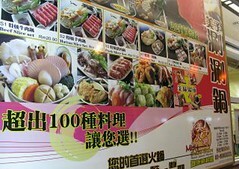 Its a not so conventional type of steamboat restaurant, where you have the sushi conveyor belt with individual steamboat. The fun thing is you can mix and make your own steamboat soup, just add in dried fish, mushroom, oyster and wala! you get your nice self-made soup. Also, there is no charcoal, no gas tanks, but electricity to heat up or keep warm the soup. 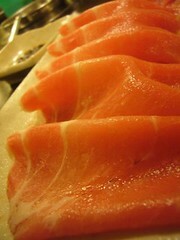 i love their thin slices of pork meat and the squid, so juicy and yummy. You should only submerge the pork in the steam soup for couple of seconds, dip into their signature onion soya source and eat the whole slice in a go. Gosh, its sinful. i enjoyed very very much the companion of my fellow colleagues as we talk about things like office affairs, pets and so on. Its quite rare for me to have the chance to share and spend time with them as i am in the business team while they are in the Technology team. However, on occasion like this (especially when good food is involved), we lose all the inhibition and laughed at stupid jokes and craps. 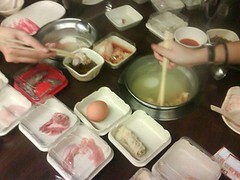 I think its really a Chinese culture to connect to each other while eating. Anyway, the price comes at RM 26 per person. If you are interested, feel free to go and have a try! Hey ho, back from the land of living and fresh out of the oven a post about a culinary day of malay and hong kong and japanese cuisine. Last sunday I attended a wedding near to me house where the son was got married to the daughter of another family nearby. For those who are not familiar with what kenduri means, it is a community feast to celebrate the matrimonial union of man and a woman following the culture and tradition of the malays. 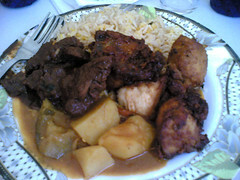 Yummy malay style fried chicken, dhal curry, beef rendang and nasi briyani. 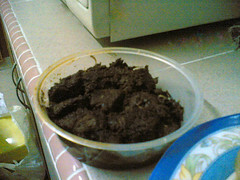 I found the beef rendang to be the best of the lot as it was tender and juicy. Following numerical order is the cheesy pork curry rice. I swear it looks like lasagna. The cheese surprisingly melds with the curry taste well. The pork was soft and tender. It also came with potatoes in it. 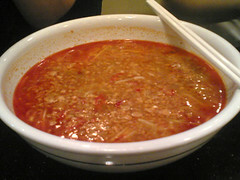 Next is the typhoon noodles which is basically curry mee but in a diffrent kind of curry soup. The soup is made out from oily cili sauce which reminds me of the cili sauce that comes along with chicken rice. It wasn’t that great in my opinion. The soup was watery and the noodles were just plain noodles. Lastly is the grilled japanese seafood rice. 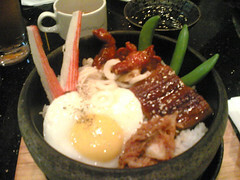 It comes with a fried egg, grilled unagi, green pea pods, crab sticks , baby octupus and shitake mushrooms. The rice was fragrant and not burnt at all. The unagi and shitake mushrooms i found were the stars of the dish. The unagi was grilled just fine. Oh and this also came with a side of kimchi. I cant wait to try more of their insteresting dishes as fusion cuisine does look interesting. Yes , I’m back with more raya goodies. This time I must say, this really is the signature food for the raya season. If you don’t eat it, it’s like not eating pizza if you go to pizza hut. I bought these together with my friend after coming home from work last friday. I haven’t eaten lemang in a year!! It costed me RM 2 for the lemang and RM 5 for the rendang which I say is decent in quantity. 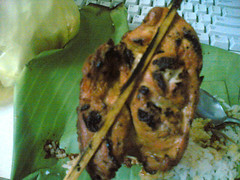 Lemang is typically sold in shafts and served in slices like so. If you’re wondering what lemang is , its glutinous rice placed into bamboo giving it its shape and roasted over a pit. Lemang must always be taken together with rendang. So after nuking these fellas in the microwave, I gobbled it all up pretty quickly. Prepare to drink alot of water as these dishes are quite dry. I ate this for lunch at commons kafe. 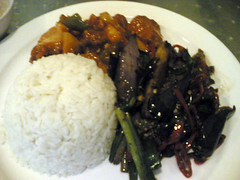 Chilli brinjals with sweet and sour chicken. I like commons kafe’s chilli brinjal. They don’t over cook it till a pulp and its still firm.The chicken was really nothing to shout about. 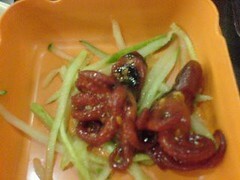 Dinner was much more interesting though since it was bought from my local pasar juadah. Pasar Juadah is a special kind of group of malay hawkers that gather together once a year to sell delicacies during the time of ramadhan (fasting month for the muslims) . These hawkers face hordes of hungry customers every evening for the duration of a month and based on what was reported in the News Straits Times/The Star, they make a whole year’s salary to last till next season. 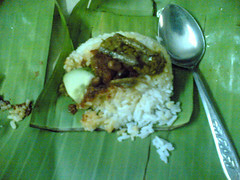 It was packed in banana leaves to seal and enhance the flavour.Like all nasi lemaks are, this came with the regular pandan rice, sambal with ikan bilis (salted fish) and nuts but the only thing that was missing was the egg since nowadays egg seems to be a chargeable accessory to a dish it is supossed to be a mandatory component of. The taste of this nasi lemak was plain. Next up was Ayam Percik. It is a Kelantanese delicacy with locals and visitors alike that is made from barbecued chicken marinated with spicy coconut gravy. This version wasnt skewered with a barbeque stick but sandwiched in between a stick. It looks like a burger patty according to picture doesnt it? This one tasted ooook. I’ve tasted better. It came with the spicy coconut gravy as a sauce but I didnt bother to open it. 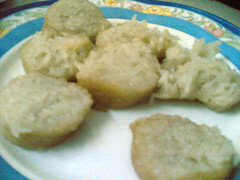 More on raya delicacies to come….. I had to come up with a name for this stall because there is no name for it. Bear with the lame name. 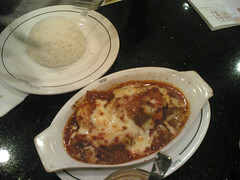 This is another once-a-week dish that I eat with John every Sunday after church. This place booms with business especially during the breakfast hours. The queue would sometimes take the shape of a snake and that shows how good this nasi lemak really is. 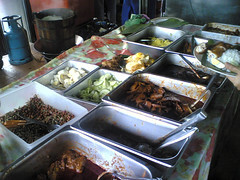 The choices of add-ons are pretty standard to the plain nasi lemak that you get; chicken rendang , fried chicken, beef rendang, bergedel which is a potato cutlet, bull’s eye egg, cockles etc. John and I aimed for the beef rendang and I topped it off with a cutlet. The beef is amazingly tender. 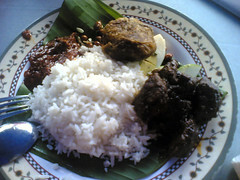 It just peels away from the hunk of fork stabbed meat compared to other kinds of beef rendang I have tasted elsewhere. The rice was fragrant and freshly cooked. The sambal was spicyly good and price wise I say it’s cheap with the total of John’s serving , mine , a cup of iced black coffee , a cup of hot milo O and another nasi lemak beef rendang came up to RM 8+ . 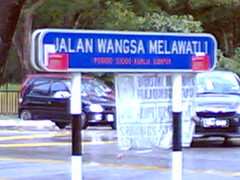 I give this place for its nasi lemak a 2 thumbs and 2 big toes up! 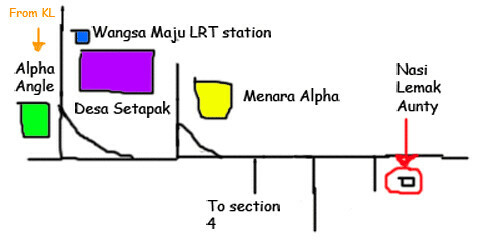 Here’s a basic map of how to get to the place , in case you want to go there.